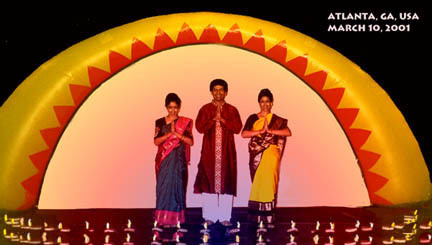 March 10, 2001, 6:30 pm: Manick Sorcar and his two daughters gave an enchanting performance at the packed Banquet Gala of the India American Cultural Association, Sheraton Hotel, Atlanta, Georgia. This was the only item and highlight of the Gala, where, prior to his performance Manick was introduced as "World renowned Indian animator" who was invited to perform his "laser animagic on stage". The half-hour program had three unique items. The opening number was a "Prayer Dance" by Sorcar Sisters (Piya and Payal) which involved a fusion of Indian classical dance with Western ballet on stage, highly decorated with hundreds of lighted Indian lamps. The second item was a laser animation show "India Forever", produced-directed-animated by Manick, which demonstrated the key milestones of India's 4500 year-old history, starting from Indus Valley Civilization (Harappa-Mohenjodaro) through the new millennium (2001). The last item "Dancing With My Soul", presented through SorcarScope (TM), gave a magnificent performance by Sorcar's older daughter Piya, where she danced with her soul - a laser-painted animated soul of the dancer brought to life with cutting edge technology. Both dances were choreographed by the Sorcar Sisters.